Whether you’ve just moved into a new space or are transforming an old one, there are a multitude of interior design tricks that can help you decorate your room to make it the space of your dreams. 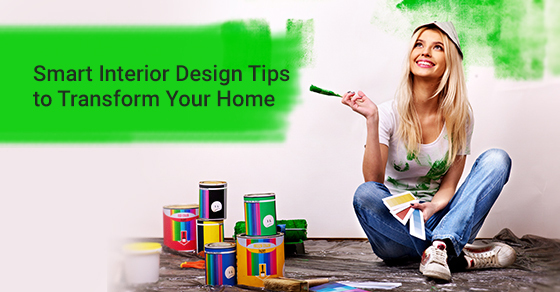 While some choose to hire an interior designer, there are a number of DIY tricks that you can use to transform your space on your own. If you’re interested to learn how to revamp your space, take a look at these design tips to help you reimagine your space during interior renovations. When you live in a small apartment or living space it’s easy to feel cramped and overwhelmed. One of the simplest tricks you can use to maximize your space is with your colour choices. You should paint your walls light and soft colours, rather than dark or over-glossed colours to make the room feel more open and spacious. You can also make a room feel bigger by adding mirrors. If you’re going for full-scale interior renovations, large windows in small rooms help to open up the space. You can use gauzy curtains in pale colours to complete the look. You can add light to a space using mirrors. If you’re in a space with a good amount of natural light, try placing a mirror or two directly across from the windows. The mirrors will reflect and amplify this natural light for a softer, brighter effect. Don’t be afraid to mix and match your aesthetics! No room is required to follow one theme exactly. Maybe you want to put an ancient-looking vase next to your funky and modern light fixture, or maybe you want to display old family heirlooms on a sleek glass coffee table. When you design, you should use the things that make you happiest. Your space should be a reflection of yourself, not a reflection of what you think an interior design should look like. Slipcovers are a great way to change the look of your furniture without needing to buy entirely new furniture. You can get covers in different colours to suit different seasonal themes. A slipcover is also ideal if you have old and discoloured furniture, but you don’t have the money to replace it right now. Wicker baskets are elegant and economical. They’re a great way to add aesthetically-pleasing storage to your room. These baskets can hold magazines, blankets, towels, books, toys, and other knick-knacks. You can also use wicker baskets on your kitchen countertops to store vegetables and fruit. How many objects do you have packed away in boxes or stored in places you never visit? Maybe you have a storage locker or a shed that’s full of these items. No matter what kind of object it is, you can probably find a use for it in your home. Old sets of plates can be used to make incredible wall decorations, while old blankets can be repurposed for curtains. Found objects can become decorative pieces on your tables or counters. Hanging pot holders are a great way to maximize your space. You’re not using your kitchen ceiling for anything else, so why not add another level of storage capability? When you hang your pots, you also have an easier time finding them when cooking with them. No more stuffing pots inside pots in your storage cupboards; everything is exactly where you want it, always in arm’s reach! Plants are a great way to add some life and colour to your living space. It’s also a great feeling to take care of a living thing. Many people feel happier when they care for plants. Just make sure that if you have pets, you don’t invest in any plants that are potentially toxic to them. Pets love to chew on leaves. Your outdoor living space could boast flower pots and gardens. Your windowsills could have planters and window boxes with bright blooms. Inside, any number of household plants could be placed all over your home. Bookshelves add a huge amount of charm and storage space to any living area. But before you stack them with books, have you considered wallpapering or painting your bookshelves? This option is especially relevant in rooms where your bookcases cover a lot of wall space. The backs of your bookshelves are an extension of your wall, so why not use wallpaper on them? Bookshelves can be painted in bright accent colours to liven up a small room. They can also be painted in dark colours that complement the paint on the wall. Consider the aesthetic choices you might want to make for your living space when you pick a colour for your shelves. Hardwood floors have a lot of character, but they can be overwhelming on their own. A great way to soften the look of a hardwood floor is by adding an area rug. You can pick area rugs that suit your personal aesthetic in colour, shape, and texture. Your rugs should make your living space feel more like home. For more information, please call Avonlea Renovations at 416-907-4764 or contact us here.